Varoufakis was too clever to understand politics. It is three years ago that I had an exchange with him on his blog about needing credible threats if one wanted to play hardball in Europe. (1) We (Brussels) give you more money if You (Athens) (a) promise some reforms and (b) tighten your belt to where it really hurts. If You don’t, You will default and be pushed out. (2) We also give You just enough money every time to (a) pay Ourselves back what is due when it comes due and (b) help Our banks in the process to take the risks away from them (who can’t really punish You that much) to the taxpayer, so We can keep playing part (1) more effectively because then You will owe Us, not them. To make it even more effective, we don’t allow Ourselves to ever write down the debt that was now socialised across the Eurozone. (3) To sell this strategy to Our constituents, it would be really helpful if You could appear unwilling to reform and tighten Your belt, so that We keep looking like We are getting something which You don’t want to yield, in return for ‘helping’ You pay back what You owe Us. Varoufakis was the one who called them out at their own game. So, by now, has the IMF, Italy, France, and even Guy Verhoftstadt. Brussels is running amok to find a compromise between those who simply don’t want this to continue and those who do, or at least don’t want to be exposed for what they have done. 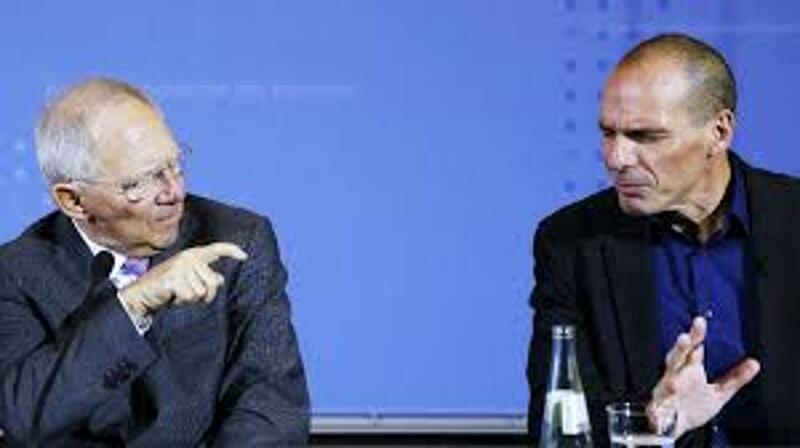 Varoufakis held up the mirror and exposed the game for the whole world to see. Politically, this is not helpful to Tsipras, who is under enormous pressure to do ‘whatever it takes’ to stay in the Eurozone, except within his own party, some of whom push in the other direction. (i) It was necessary at every step to pretend that Athens didn’t actually want to enact reforms. This game keeps on going today. It is also extremely counter-productive, as reforms always have to be dressed up as something for which there is no local support in Greece, which is neither true (the Greeks understand very well the causes of the crisis, except the component or inter-generational equity), nor helpful (reforms that are seen as imposed from the outside are not politically sustainable). (ii) On purely economic grounds, it would have been in Greece’s best interest to exit the Eurozone as early as 2010, and it wouldn’t be too soon now either. It’s just that politically this step is unacceptable in Greece, and Greece is unable to take the necessary administrative steps to get through an exit without extremely significant damage along the way. This allowed Brussels to pretend that they were doing something that Greece really needed (keeping them ‘in’, because defaulting was never a real option Greece could choose), and to pretend that Greeks weren’t really that keen to be ‘helped’ and needed to therefore be kept on a very short leash. (iii) The public sector (both Brussels and Athens) took steps that, in the private sector, would be criminally unlawful: For Brussels to use taxpayer money (which they are entrusted with) to lend to an insolvent party, and for Athens to accept further debt when clearly insolvent. If the EU was a corporation, shareholders would have sent the ‘directors’ to jail over tort, and if Greece was a corporation the general prosecutor would have jailed the ‘directors’ for wrongful trading. But because this is politics at the highest level, the steps both sides took ostensibly were legal. We have a huge rift within Europe now, between those who want to end this game and those who need it to continue because they engineered the game and because their public back home have bought into it. But now that the dissent has started within the non-Greek members, it is clearly unhelpful to Tsipras to have someone in his own ranks taking sides. He had to tone down his own anti-European rhetoric quite a bit in the last week. When faced with tremendous pressure back home not to risk Grexit, he can’t keep calling Brussels out at their own most cynical game. As I said after his impassioned speech at the European Parliament, he is a true friend of Greece. He is of course also a true friend of Europe. On Tuesday, Tsipras made people angry by not delivering a proposal. Wednesday’s speech by Guy Verhoftadt was misconstrued by many as an insult to Tsipras. It was not. It was an impassioned plea for Tsipras to do his part, so that The Eurozone can do their part too. Importantly, Verhofstadt said himself that more austerity and more debt to pay back the old one is not the solution for Greece. A program for growth, which includes a strong commitment to reforms by Greece, and a strong commitment to debt sustainability by Europe, that is the solution Verhoftadt is seeking. It would be a break with the old game, and we no longer need Varoufakis to tell the Europeans that. Varoufakis for his part has misunderstood politics, and I think he continues to misunderstand it. He didn’t understand that he was set up to take a beating whatever he would say, because the game was set up that way. He thought that logic and truth prevail in the end, even if you are a messenger whom people wanted to humiliate regardless of the message. He wrote in his blog that Schaeuble always wanted Greece out, and that five months at the negotiating table have convinced him that this is the case. Like many, Schaeuble just wants to have his cake and eat it too. He wants to have a currency union with weaker partners, so that Germany can benefit from a weak currency. He also wants to blame the weaker partners for their economic performance rather than blaming the currency, so that Germany doesn’t have to pay any more than necessary to keep the illusion of a true union alive. He is willing to pay a dangerously high price in terms of political cohesion of the union. We will find out very soon how far he is willing to go, but certainly he is not ready to quit the game described above, irrespective of Grexit or no Grexit. Ironically both outcomes will suit him: A Grexit because he can continue to play the game even harder with others (Varoufakis’ point), or a Greece that is seen as being dragged back into the Eurozone kicking and screaming, setting itself up for an even bigger blame game down the line. He doesn’t want Greece out of the Eurozone; Instead, he doesn’t care! What he does want is a currency union that isn’t functioning properly. On the one hand, this allows him to pretend — at least back home — that the game he has set up for Greece is a righteous one, and on the other it gives him a very cheap currency to further boost Germany’s export growth without incurring the true cost of ever-closer union quite yet. The approach is deeply cynical and unsustainble, but he’s scoring political points back home every day. Either the currency union will disintegrate, or the costs will materialise, but not yet, and not on his watch. For now, he will be able to continue the game, and Tsipras’ actions this week confirm that Schaeuble has already won this round: Greece will bow to any demands to stay in the Eurozone, and will end up humiliated in either outcome. Varoufakis told them the union is FUBAR, but Greece’s leaders never had an alternative to staying ‘in’ at all costs. It is right that he cleared the stage, now that some Europeans are delivering his message instead. What can be done? Greece and everyone would do very well to put the institutional and operational framework in place for a collapse of the currency union. Ironically, if Greece had, at least operationally, the option to exit, it would have a credible and substantial threat in its hands. The game would look different. That would be a benefit to Greece and to everyone else. Until then, Greece is a bystander, and the last thing it needs is Varoufakis’ messages delivered in Brussels by any Greek leader or Greek lecturer. With or without Greece, the Eurozone will have big problems to sort out internally, and what Schaeuble wants he cannot have forever. ← How Will Merkel Square Her Circle? Karl, great overview, solid conclusions. I’m surprised you’re so tough on Varoufakis, given some of the glow in your earlier missives. The best of all worlds might be to get Greece into a position where it can exit on its own terms, in dramatically better shape than it is today, and with a future less tied to the Euro. Sweden and the UK come to mind. But a lot of heavy lifting is required. Greeks are not close to the point where they can function without the hammer of outside discipline. Greece should use this time to increase the structures required to function independently. There is more than enough local brainpower to see this happen. When you’re in a hole…stop digging. You know Karl as well as any intelligent person that continued Greek participation in the Euro can only be with further integration including a common taxation and wealth transfer policy. As this is politically untenable – and would take years anyway – its time to face the alternative. The sooner it’s faced the sooner the recovery can begin. Time for the Eurozone to organise an orderly Grexit and concede what we all know anyway. Inherent design flaws meant the Euro was always – and still is – doomed to fail. But it’s time to stop the bleeding.